You have to go back to the days of the old Winfield Cup to recall the last time a team in Australia's premier rugby league competition went back-to-back, 26 years to be precise. Brisbane Broncos, led by current England coach Wayne Bennett, beat St George in the 1992 and 1993 Grand Finals to clinch consecutive premierships. 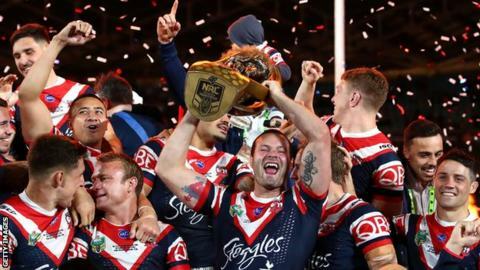 Sydney Roosters, the best team in the National Rugby League in 2019, are the latest side to try to retain the Provan-Summons Trophy. Fresh from winning the World Club Challenge against Super League counterparts Wigan, Easts are ready for the test ahead in 2019, which begins with Friday's derby against bitter rivals South Sydney. "It's definitely hard," skipper Boyd Cordner told BBC Sport. "I'm not going to sit here and shy away from the question, I want to win the comp again. I know how good the feeling is, that's why we play NRL and push ourselves in pre-season. "You're kidding yourself if you're sitting here and think it'd be good enough to make the finals. "Will it be hard? Yes, it will. Will there be challenges and hurdles? Yes, there will. It's about how we prepare and handle that throughout the season. We'll see how hard we work to get the success we want." There are no shortage of challengers to the Roosters' crown in 2019. St George Illawarra have England duo of James Graham and Gareth Widdop, and added quality in the shape of Korbin Sims, Lachlan Maranta and Corey Norman. 'Supercoach' Wayne Bennett has taken charge of South Sydney Rabbitohs, working with the three Burgess brothers Sam, George and Thomas. Melbourne Storm - last season's beaten finalists - have retained skipper Cameron Smith and despite Billy Slater's retirement, still have representative talent in Cameron Munster, Josh Addo-Carr and Will Chambers available. Cronulla have signed mercurial New Zealand half-back Shaun Johnson, adding another quality half to their squad, but are without NFL-departed outside back Valentine Holmes. The Roosters themselves have bolstered the squad, with Rabbitohs' impressive New South Wales Blues back-rower Angus Crichton joining Brett Morris and England wing Ryan Hall for the new campaign. Although it has been some time since a club has won consecutive titles, Roosters' marquee half-back Cooper Cronk has had his hands on the trophy in consecutive years. He was a winner with Melbourne Storm in 2017 before his multi-million dollar move to Bondi for last season's triumphant campaign. "The NRL is one of the toughest domestic competitions in the world," Cronk said. "It goes on for 25 rounds. You've got some of the best athletes in the world from an athletic and endurance basis, smart coaches, and the whole idea is can you still stand up and do your thing on the last day of the rugby league calendar. "It's been difficult for a lot of teams over the past 25 years and our approach is going to be no different. We'll take it day by day, training session by training session. "One thing we can take confidence from is our trajectory of performances were improved game by game. We played our best football at the back end of the year. We know we can do it, we need to work it, guys who are striving and hungry enough to want to get back there." Last season's title was Eastern Suburbs' second under the stewardship of Trent Robinson, who rebuilt the side from a 2016 second-bottom finish to champions within two seasons. The former Catalans Dragons coach won the NRL title in his first season in 2013 and has also won four minor premierships. Cronk has played at Melbourne under Craig Bellamy, for Queensland under Mal Meninga and for Tim Sheens as an Australia international, and would place Robinson among such luminaries. "Trent's got a rugby league IQ I've never seen before," Cronk said. "It's right up with the best I've been involved with. He's about creating better people rather than just better football players. "We're in a business of winning and losing that we get judged on, but Trent puts doing the right thing by people, values, morals, ethics first before winning games of football. "If you create better people you create better football players and Boyd Cordner is an example of that. He's set himself in stone with the Roosters culture." The development of Cordner under Robinson has been one of the former Toulouse player's big success stories, having turned him from a promising academy product to a World Cup and Origin winner, and premiership-winning captain. "He's unreal, I'm sure he's been a coach in a past life," Cordner added. "The stuff he comes up with and the way he conducts a room and goes about his footy. "Trent's one of the most intelligent blokes I know and also the gentleman he is. He really cares about what you're doing more outside football than on the pitch itself. "It really helps get the best out of us, and makes us as a playing group want to play alongside him even more. I've got a lot to thank him for in my success and the club's success. He's been a leader and mentor."